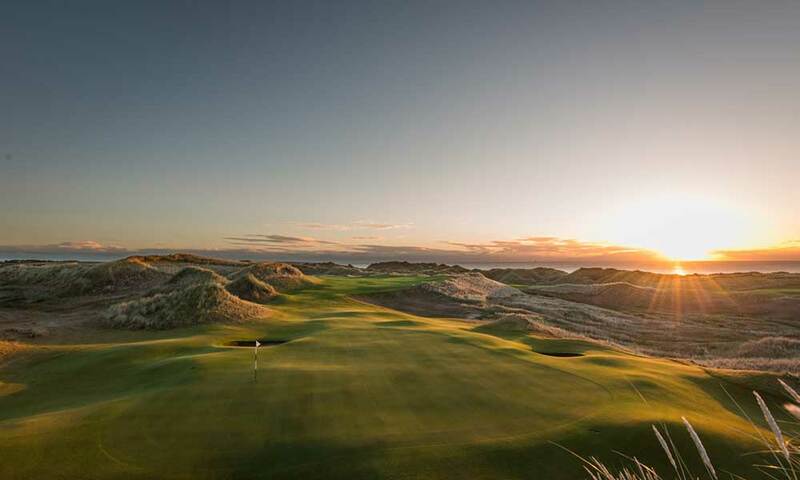 The central focus of the development is the golf course designed by Dr. Martin Hawtree, the acknowledged master of links golf course architecture. The championship golf course is a classical Scottish links. The course has a Par of 72 and a maximum length of just over 7400 yards. The golf course follows a classical pattern of two out-and-back loops of nine holes. All 18 holes thread their way engagingly through the dunes, rising to find views of the sea and coastline, plunging into secluded valleys, offering a sequence of superlative topography, landscape, alternating spaciousness and enclosure, panoramic views, a rich texture of vegetation and wildlife habitats surrounding the golf holes. Each hole has six separate tees catering for all classes of golfer. The bunkers are placed to challenge the stronger player and not unduly punish the weaker golfer. All bunkers are turf-revetted in traditional style to combat wind and erosion and sand-blow. Greens have been sited in natural promontories and valleys and are featured in relation to their setting.